Flagrant food fawning: Sharp and sweet lemon treat! Sharp and sweet lemon treat! What better way to make use of a bowl of lemons sitting on the kitchen bench, (thanks to the generous offerings of our neighbours' tree) than to make a lemon tart! This recipe is similar to the one in Stephanie Alexander's The Cook's Companion - which can also be found here. She adds raspberry puree for a twist which imparts a lovely pink colour but I kept it simple. Luckily for me, the recipe is foolproof but I forgot and only added 5 eggs. I then worried the tart wasn't cooked in 40 minutes because the crust had formed but the mixture below wobbled quite a lot, so I left it in the oven for another 5 minutes and then worried it had curdled until we cut a slice and saw the beautiful and smooth but set, lemon curd. Yum! I like a good deal of acidity (and used 3 large lemons), which makes your lips pucker but is quickly tempered by the creaminess of the curd. 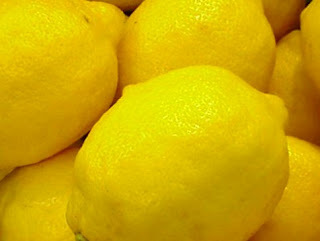 However, if you want to tone it down 2 small lemons with adequate juice should suffice. Since the recipe called for 3 lemons only, I decided to use another to make a llight syrup to drizzle with some julienned peel. Now, other than trying to learn to juggle- I need to think of some other dishes to use up the remaining fruit- lemon pudding? syllabub? chutney? at 8:49 am Posted by M? Oh it looks so lovely - lemon tart is one of my favourite desserts. yum m's! how about making preserved lemons? yum! those are some seriously vivid looking lemons! And i agree with you what's the point of using citrus flavourings if you don't have the zinginess to give it a kick! All up very delicious! !